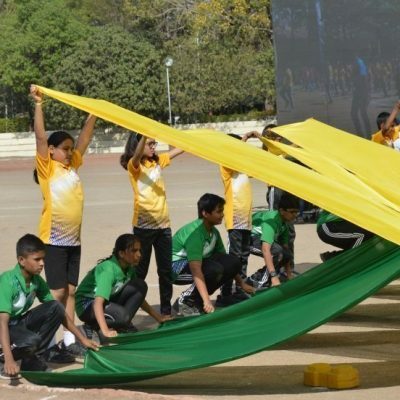 The event was celebrated by an astonishing March Past display by the students of all houses with vivid colors, each representing the Yellow House, The Blue House, The Green House and The Red House. The march past salute was taken by our Hon’ble Chief Guest Rear Admiral DV Taneja, VSM (Retd) followed by an ardent speech. 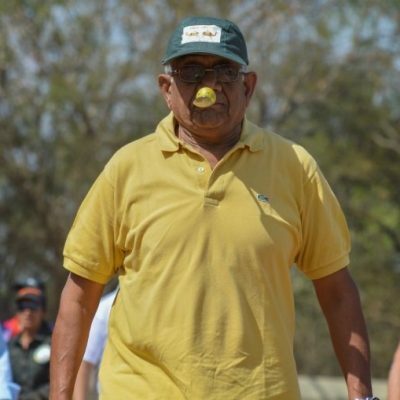 He emphasized about the importance of sports and the habit of sportsmanship in our daily life. With hearts filled with excitement and eyes on the grand prize, the games began. 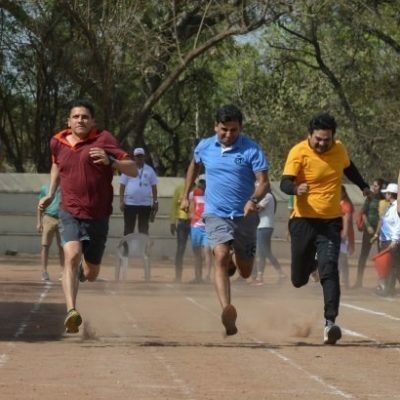 The very first event sparked the thrill within all with a super-charged 100 m, 400 m and 800 m dash and a 4X400 m relay race making the crowd jump off their seats and cheer from their guts. 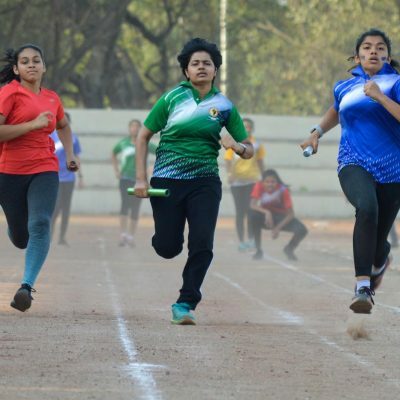 Both boys and girls sprinted with their sheer speed and strength reflecting the extreme level of constant practice they had endured for this special event. 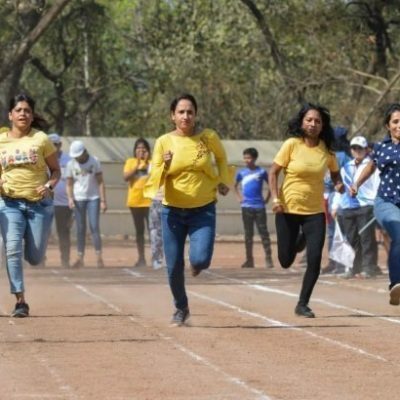 Especially the Girls, who dropped everyone’s jaws by displaying way above the average amount of speed and flexibility, during their sprints, final bursts and relay races. But of course, when you talk about VKE, you talk about a new perspective towards everything. Why limit a sports event simply to children when physical fitness concerns one and all. 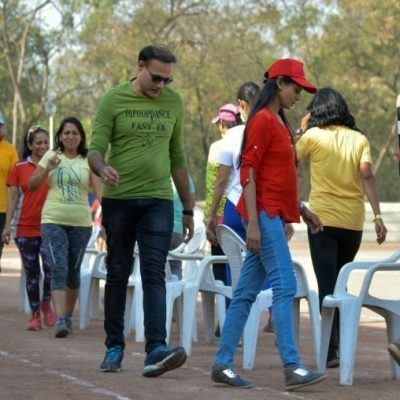 Hence, there were a series of special events arranged for the Moms, Dads, Grandmas and the Grandpas of VKE family proving that fitness does not align to any limits of age. 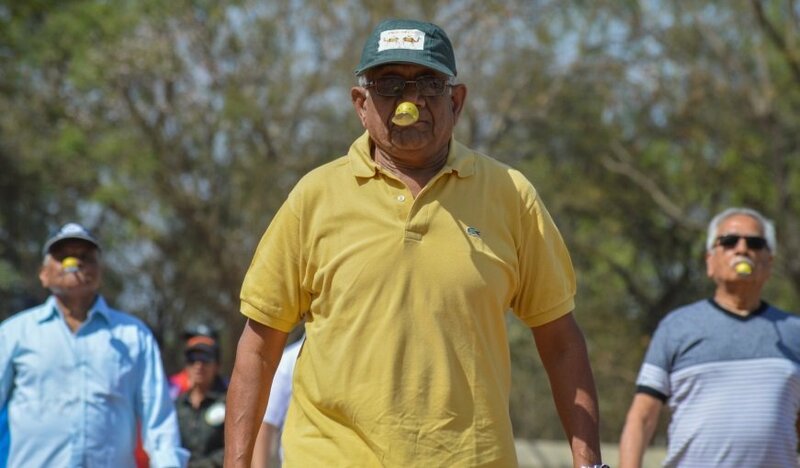 These events included a fun 40 m lemon-spoon race for the Grandparents, a 50 m and 60 m flat race for the Moms and Dads respectively along with a 2X50 m relay race and a 25 m step stone race. And to add to the elder’s delightful experiences, they all also battled for the final chair in the game of Musical chairs. Physical stability and strength can be expressed through many other forms than just track based athletics. 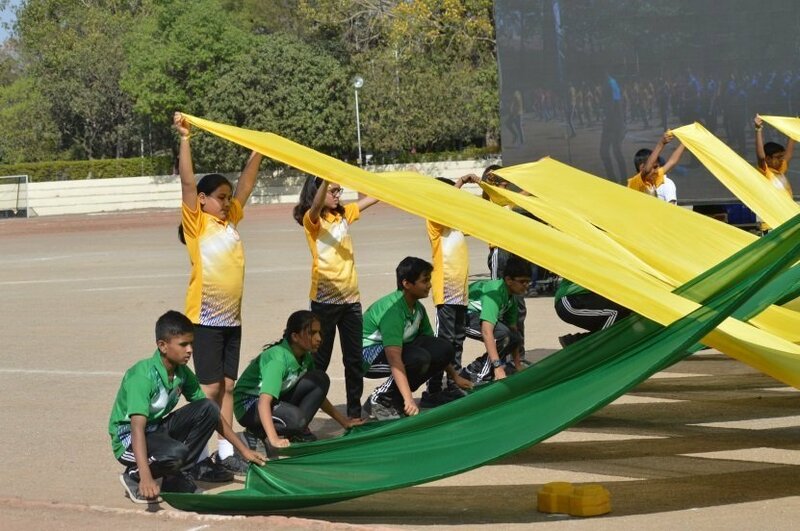 And such forms of display were elegantly performed by kids from different grades to expressing the diversity within the realm of gymnastics and Martial arts. The girls of MYP 3 startled the audience with an elegant and energetic Zumba dance. 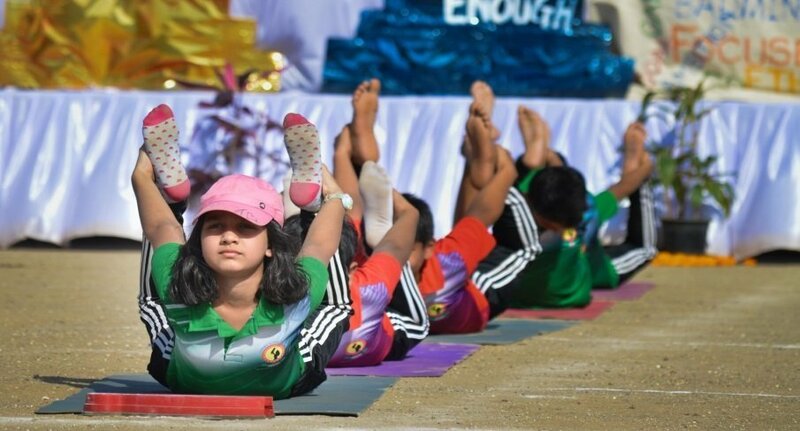 Aligning to their belief and practice of the Yogic philosophy, the champions of MYP 1 put forth a mesmerizing Sun salutation or Suryananmaskara along with a traditional Bharatanatyam group performance. 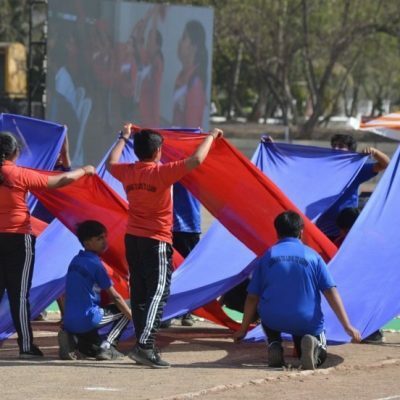 To mark the spirit of sportsmanship amongst all houses, despite the extremely competitive behavior developed in our athletes, kids of all houses in MYP II, came together to display a colorful and unifying House Drill. 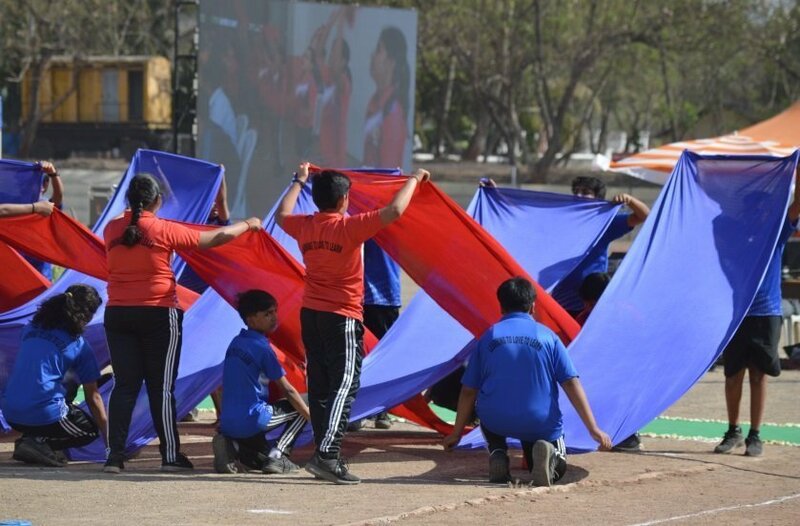 With fabrics depicting the colour of their houses, they painted the ground with colourful shadows in every single step of their performance that afternoon. 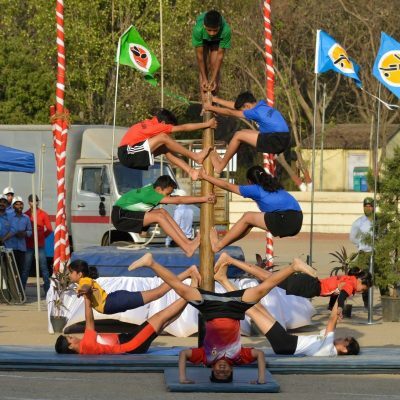 Malkhamb – An Indian pole art form which requires severe command on physical strength and stability is also a common and appreciated sport in VKE. And our kids sure didn’t hold back when it was time to present their pole and rope skills during their breathtaking Malkhamb performance. 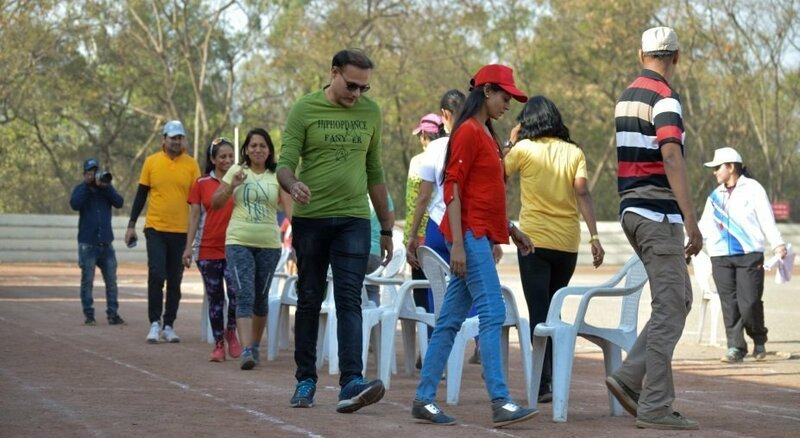 Even very small girls and boys, mesmerized the spectators with their bravado and a rare sense of speed and balance. 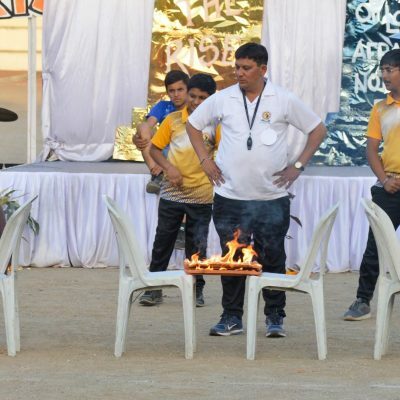 It was followed by the MYP students’ karate-chopping thick clay tiles blazing in flames as they performed their traditional Martial Arts routine. Finally, our beloved President Sir Robbin Ghosh, who is admired by all for his extensive level of study in the fields of ancient Vedanta and Yoga, shared with all, a few words on sportsmanship and how we, as parents and teachers, can utilize our kids’ spirit of sports to help them discover the hidden potential from within themselves. This process of discovery, no matter how long and exhausting it may pose to be, must help our kids understand that the only way to achieve anything in life, is to build ‘a never give up attitude.’ The day concluded with a Prize Distribution Ceremony for the parents and grandparents who revamped the entire event with their flabbergasting performances. It was a day the kids would definitely look back to this day, as they advance towards their bright future. There was an unmistakable air of fun, joy and laughter in every one’s face.